For over a decade now, America’s wild horses have been experiencing a nightmare that never ends. George W. Bush — who considered himself a ‘cowboy’ despite his blueblood upbringing — opened the door in 2005 to allow the slaughter of wild horses by signing into law a bill pushed by his own Department of the Interior — a bill that effectively condemned tens of thousands of horses to be destroyed in slaughterhouses. That legacy continues today, furthered by officials within the Obama administration when Ken Salazar was appointed the Secretary of the Interior. According to a damning report from the Office of the Inspector General exposing Salazar’s role in the slaughter of at least 1, 800 horses and burros while the BLM [Bureau of Land Management] was accused of the mismanagement of the wild horses and burros in their purvue. Salazar, the report concluded, worked with a business associate to sell the animals to kill buyers who then provided them to slaughterhouses across the border in Mexico. In fact, immediately after his appointment by then President Obama, the process began. Years earlier, an expose initiated by animal advocate group ‘The Fund for Animals’ has discovered BLM participation in sending horses they had rounded up to slaughter facilities throughout the country. BLM reform followed, with the agency reorganizing their adoption protocol to stipulate that no single individual could ‘adopt’ more than four horses or burros via the agency’s program. The Department of the Interior was pressed to include slaughter-specific language into future bills by the Humane Society of the United Stated, furthering the effort to ensure that horses and burros would not be sent to slaughter. Still, the BLM has been repeatedly accused of mismanagement, of continuing the practice of cruel, inhumane and unnecessary roundups and of placing the horses and burros into facilities that are, for all intents and purposes, are not fit for them to inhabit. Proponents of the establishing safe habitats for the horses and burros do, in fact, advocate for the safe and effective use of PZP — a reliable method of curtailing reproduction among herds. The proper utilization of PZP would, in fact, render roundups and penning obsolete, allowing the horses and burros to live out their remaining years in peace and relative safety. 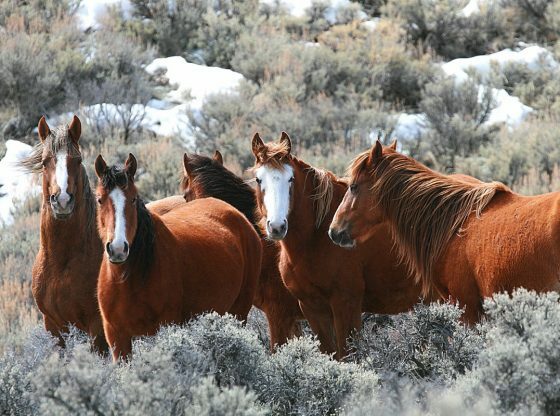 Even the National Academy of Sciences has weighed in on behalf of the horses, urging the BLM to use PZP to control fertility among the herds.